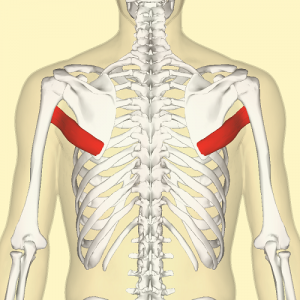 Teres major is a small muscle that runs along the lateral border of the scapula. It forms the inferior border of both the triangular space and quadrangular space. 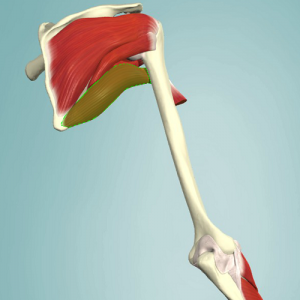 It's sometimes called "lat's little helper" because of its synergistic action with the latissimus dorsi. TrPs in teres major muscle typically refer pain into the posterior deltoid region and over the long head of the triceps brachii, as well as into the posterior shoulder joint, occasionally into the dorsal aspect of the forearm, and rarely into the scapula or elbow. ↑ 2.0 2.1 Biel A (2005). Trail Guide to the Body (2nd ed). Boulder, CO: Books of Discovery. ↑ 5.0 5.1 5.2 5.3 5.4 Netter FH (2014). Atlas of Human Anatomy (6th ed). Philadelphia, PA: Saunders-Elsevier. ↑ 6.0 6.1 6.2 6.3 Travell JG, Simons DG, Simons LS (1998). 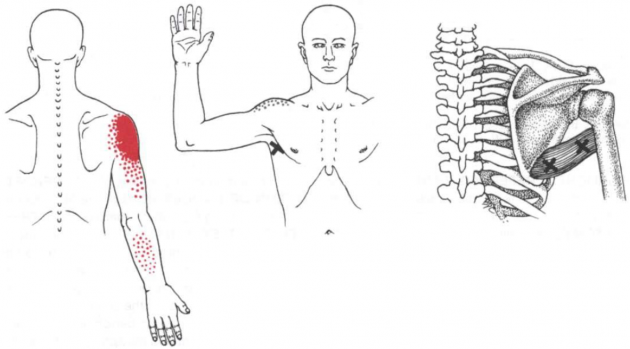 Travell and Simons' Myofascial Pain and Dysfunction: The Trigger Point Manual, Volume 2: The Upper Half of Body (2nd ed). Baltimore, MD: Williams & Wilkins. ↑ Sanzo P, MacHutchon M (2015). Length Tension Testing Book 2, Upper Quadrant: A Workbook of Manual Therapy Techniques (2nd ed). Canada: Brush Education.